The point is this: With such a large supply of bank-owned houses, of course houses will continue to fall in price. When a store has excess inventory, they need to have a discount sale to get rid of it, the same is true for houses, and banks are taking more houses every day. Banks live and die by their balance sheets. If a bank has the cash to keep these houses in their possession, hoping that the prices will stabilize and that they can sell at prices that allow the banks to recover the unpaid mortgage, then they will keep on trying to sell houses in the usual retail market. As soon as a bank runs short of cash, or can no longer carry the costs of the property taxes and the maintenance for all these houses, they will sell their houses at fire-sale prices, probably even at auction. No reserve bids, the highest price gets the house free and clear. This should have happened back in 2009-2010. Banks, short on cash and overloaded on houses and notes for houses, would have had to dump them for whatever they could get. This would have caused a sharp decline in housing prices, but as the houses were sold and put back to work – the job of a house is to shelter people – the supply would have been worked through and housing prices would have recovered and stabilized in relatively short order. And then came the TARP bailout. The federal government gave billions of dollars in checks to the banks, giving them a â€œcapital injectionâ€ – putting cash on their balance sheets – hoping that the banks would lend it out. They didnâ€™t. 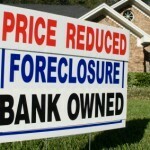 They kept it in cash, and were able to carry thousands of foreclosed homes on their books through the crunch of 2009-2010. Instead of a flash drop followed by a recovery, the American homeowner was â€œsparedâ€ a deep but short fall in home prices and instead have been subjected to this long, slow death march of declining home equity. The decline we got may have been slower, but it will be longer, guaranteeing that more private home owners will be forced – by a bad economy, relocation, or retirement – to try and sell their most expensive asset in a market that is still actively falling. As for potential buyers, the odds are that the longer they hold off making a purchase, the better deal they will get. If we had skipped TARP, then this glut of houses would have been worked through by now, sold at auction either by the banks or by the bankruptcy trustees of the banks that didnâ€™t get the message of the markets. Politicians that supported TARP are still finding ways to rationalize it. â€œWe needed to preserve the financial system.â€ â€œWe needed to prevent chaos,â€ and on, and on, and on. All they achieved was to prevent real bargains and guarantee continued oversupply. They need to be held accountable for their support of that pathetic misstep passed under the cover of hysterics.